**Interested in getting a quote on a custom coloring book? **Do you need an illustrator to create artwork? We can help you! We have a full staff of trained illustrators. Click here to check out the type of artwork and styles we can do for you! Buy direct from the Publisher and Save! No distributor, broker or association fees. When ColoringBook.com designs a custom book for you or your organization we can provide all the services: graphics, editors, writers, artists and all books are reviewed by educators. 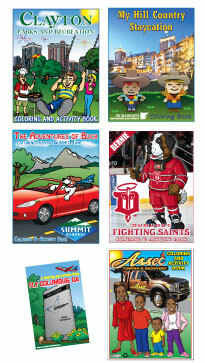 Browse the categories of custom coloring books below or click 'view all books' to see them all! Contact ColoringBook.com Via E-Mail Every City - Every County - Every State Call 1-800-244-2665 for details.